​I'm not sure what's worse, ​Michigan State's loss in the Final Four or its new uniforms. The school revealed new alternate uniforms that will be worn in the 2019 season, and not only do they look hideous, but they also apparently bear the ​Seattle Seahawks' logo on the glove? Seriously guys, what's going on here? ​​It takes a true stroke of genius to create uniforms that are both hideous and unoriginal. The Spartans created a mix of shades of green that simply don't go together. The lime green lettering, which doesn't even fit on the front of the jersey, looks hideous on the forest green background. The garish lime green pants are equally terrifying. 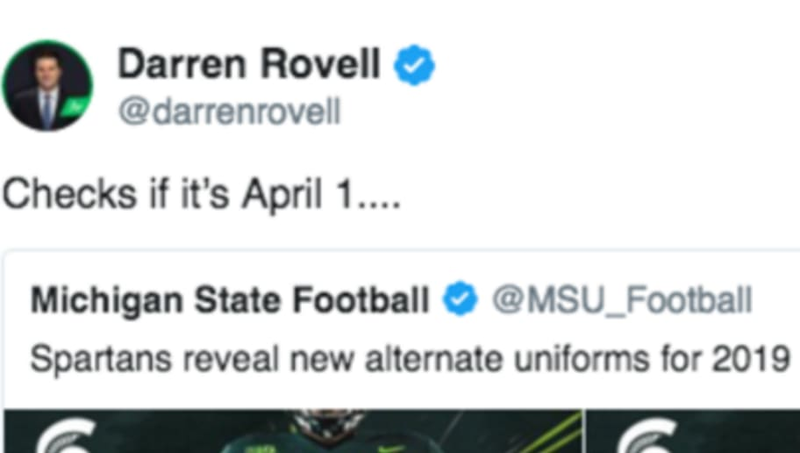 ​​As you might expect, the Spartans are getting destroyed on Twitter after the jerseys went public. ​​Nope, it's not April Fool's Day, Darren. ​​Even fake Woj may be on to something here. Jessica is right, the Jets are the real winners in all of this. Allen Robinson from the top rope? You better believe it. Unfortunately for Michigan State, today is not their day. Fans can only hope their season goes better than the reception the new gear is receiving.